It seemed that summer only just arrived, but already I notice the crickets singing loudly every night, and the first yellow leaves floating to the ground here and there. First day of school is just around the corner and the nights are cooler. The farmers got their haying done last week while the weather was good, and the first county fairs have begun. So it seems like a good time to do an autumn painting. 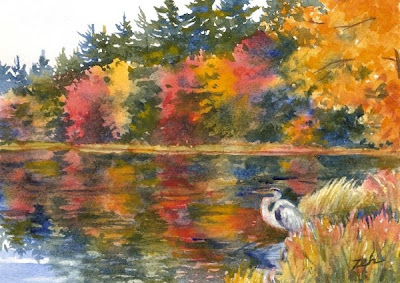 In this painting, the New England fall foliage is at its peak, colors reflecting in the pond as a heron stands silently amidst all the beauty.